Body only unit (no battery or charger supplied). 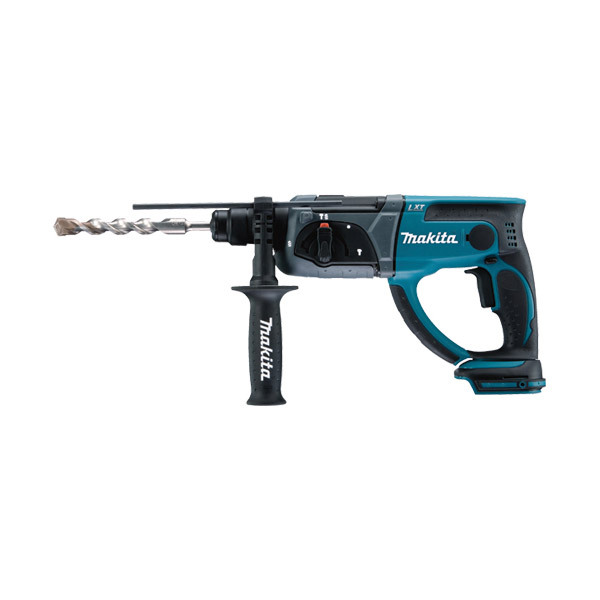 Compatible with Makita 18V Lithium-Ion batteries. • Lithium-ion’s 40% weight saving means 18 volt power can be obtained by a battery that weighs the same as a 12 volt Ni-MH battery. • Lithium-ion batteries have greater life spans than their Ni-MH or Ni-Cad counterparts giving 430% greater run time. • Conveniently located push button for forward and reverse. • LED job light with afterglow. • One-touch sliding chuck for easy bit changes. • Triple operation mode: Rotary only, hammer only and rotary hammer. • Rotation mode: The chisel can rotate a full 360 degrees with 40 different locking positions.